There are many animal themed decks out there both self published or by big companies, featuring all kinds of animals but decks with rabbits there are few (as a matter of fact this is only the 2nd one I found and bought). The artist has worked 5 entire years on this deck of anthropomorphic rabbits featured in images that are interesting renderings of the WCS-tarot but seen through rabbit eyes. The cards echo at some places classical works of art, general culture or ancient mythology (doesn't that empress remind you of a certain Venus and that 3 of cups made me think of Alice in Wonderland...) there is even place for my favorite Egyptian deity. The deck is for sale at miss Clayman's Etsy shop in 2 versions an 78 cards one and one with 83 cards where the 5 extra cards are Thoth-tarot versions of The Emperor, The Star, Lust and Adjustment (Balance) and also an Happy Squirrel card. 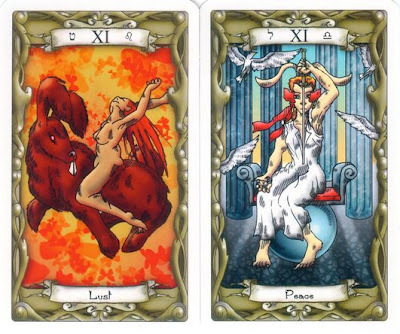 Tarot has become mainstream and can be found in all kind of applications, milieus and supports, from the most commercial to the highest art. As a system to work around with many artist it's perfect and many collaborative decks have been created by artist, here it's the Hive gallery from Los Angeles that has gathered artist around it and has produced 2 majors only decks (even if both projects counted 78 cards) out of it. Although both times the WCS served as a base for the project, the artist deviated from it, and somethimes even radically! The first Hive tarot was produced in 2009 in a limited edition of only 100 decks. I hope these 2 will be the start of a long running tradition at the Hive gallery with may more decks published on a yearly base. The April edition of the ATS is out now and contains an extremely interesting article on the Xultun Tarot. Etsy has become an interesting source for tarot decks these last few years, directly from passionate artists making small print runs or even individually handmade decks and sharing those on their shop. One of these is Sara Pulver who during the year 2010 created each card in no particular order and beginning of this year she started selling the 22 majors as an ACEO-set printed on very light cardstock and each card put into acid free cellophane envelopes. It's always nice when a deck you search and that was Out-Of-Print comes back available.Back in 1991 Hungarian painter Katalin Szegedi created a wonderful majors only deck accompanied with a book written by Zsófia Lázár the deck hence known as the "Szabo/Szegedi - A Tarot", has sadly has been OOP since a loooong time, even before I seriously started collecting. Interesting decks with historic importance do not always have to be expensive or hard to find, proof of that is this interesting find I did on eBay during one of my daily overviews hunting down interesting decks to add to my collection.